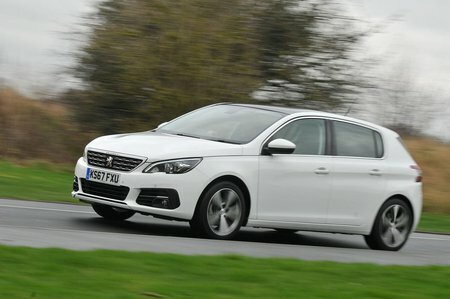 Peugeot 308 1.5 BlueHDi 130 Active 5dr EAT8 2019 Review | What Car? What Car? will save you at least £2,471, but our approved dealers could save you even more. Active trim is the cheapest way into a 308. It comes as standard with 16in alloy wheels, climate control, rear parking sensors, a leather steering wheel, automatic lights and wipers, a 9.7in colour touchscreen with sat-nav (plus MirrorLink, Apple CarPlay and Android Auto smartphone mirroring) and driver adjustable lumbar support. It’s our pick. A worthy replacement for our former favourite engine in the range, the 1.6 BlueHDi 120. Not only is this new 1.5 more powerful than the unit it replaces, but it’s also cleaner and more frugal. With plenty of low-down grunt, there really is no need to step up to the larger and more expensive 2.0-litre diesels. It’s our pick of the diesels.